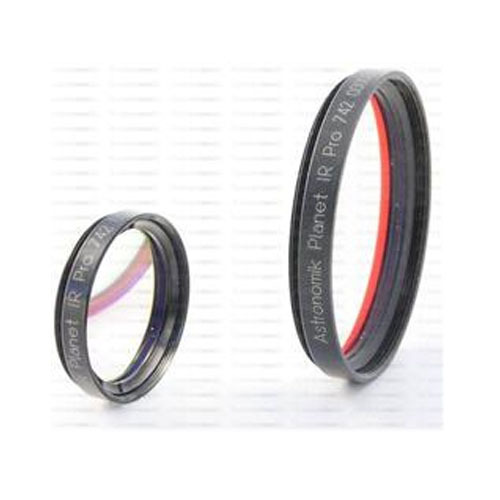 The planet IR Pro 742 only allows infrared light with wavelengths of more than 742 nm to pass. In this wavelength range the effects of seeing are significantly lower than in the visible spectrum of the human eye. This allows much sharper images than are usually obtained from your device and location. Another advantage is that the sky background of advanced dawn is dark and so the filter even allows photography of the planets and the moon at daylight. The Astronomik ProPlanet 742 cuts off the visible part of the spectrum and allows the light of wavelengths longer then 742nm to pass. Due to this behavior the part of the spectrum that is most sensitive to bad seeing is rejected. This approach does a big improvement to the imaging of planets and the moon. The image is more steady than the image in the visible light with nearly identical exposure times. When the seeing is very bad and the instrument is 10" (250 mm) or larger, the Astronomik ProPlanet 807 may be the better choice.